Bed And Breakfast538 sq. 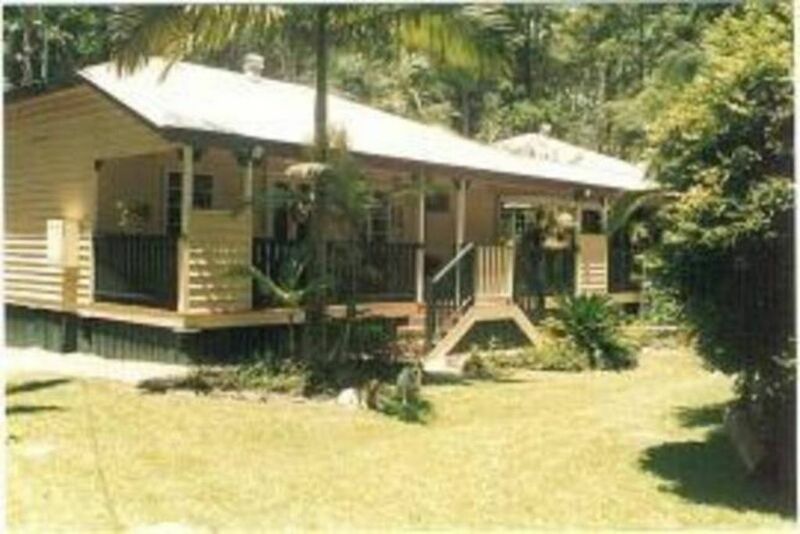 ft.
private cabin set in rainforest in the Tanawha Valley at the western foot of Buderim Mountain at the centre of the Sunshine Coast.The cabin, a converted church hall is attached to our 1920s Queenslander via verandahs and decks. Privacy is ensured in the spacious surrounds encompassing lounge room, kitchenette. king bedroom, shower ensuite and second twin-share bedroom. A menu-style hot breakfast,sparkling wine,port& chocolates, afternoon tea on arrival (subject to suitable arrival time) are all included. 90km north of Brisbane,take the Sunshine Motorway exit, take Buderim exit left, go straight ahead on Old Bruce Highway (Tanawha Tourist Drive),past Superbee and turn at road before windmill(Main Creek Road) 1.2km on right behind tall picket fence. Wonderful hosts who are very proud of what they provide and obviously love what they do. EVERYTHING is catered for. Accommodation is well presented, clean and tidy with a yard that is so peaceful but more importantly very safe and secure for our wee pup. Thoroughly enjoyed our stay - would highly recommend. We will be back! A fantastic BNB to stay at that included our beloved pet dog. L&P were friendly ,helpful and still allowed our privacy . The accommodation was comfortable ,clean and quaint . We would not hesitate to stay again ! Gorgeous cottage with delightful touches everywhere! We loved our stay at Main Creek Bower B&B over the long weekend. Very centrally located on the Sunny Coast. Love all of the traditional furniture and decor, so quaint and very comfortable.The generous provisions and breakfast menu made us wish we were staying longer!! We really enjoyed our stay. It's was great having our pet dog with us, knowing that he was safe and accommodated for. We came upon this B&B by sheer fluke and we could not have been happier. From the welcoming owners that go out of their way to ensure you have a perfect stay including home made scones and cake on arrival as well as a huge bowl of fresh fruit restocked everyday. The actual cabin is large, extremely comfortable and air conditioned. This place really is absolutely fantastic. We would highly recommend this place for any couple travelling with small dogs. It had everything we needed and some added extras that made the stay feel like staying with friends.